Plowing and Selling Produce, Walters Art Museum, Ms. W.749a, originally uploaded by Walters Art Museum Illuminated Manuscripts. Above a farmer plows; below a seated young man watches a produce seller weigh his purchase. Such scenes of everyday activities became especially popular in the medium of drawing. On the rocks in the center foreground of this tinted wash drawing is inscribed the name of one of the most famous painters of 17th-century Iran, Riza ‘Abbasi. As the signature on the painting does not match that of the artist, an admirer of Riza’s work may have attributed the painting to him. The inscription Riz̤ā ʿAbbāsī appears in the rocks in the center foreground. 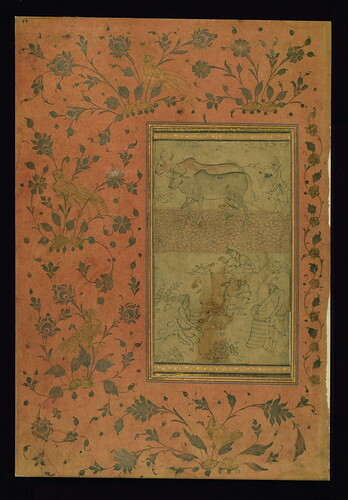 The image is surrounded by a two-toned floral and fauna motifs borders on pink-tinted paper.